Wingshooting USA host and creator Scott Linden has engaged audiences from South Dakota to Chicago with his fast-paced and insightful observations about birds, dogs, hunters and the outdoors. A former teacher and musical performer, Linden’s presentations always educate as well as entertain, leaving audiences asking for more. Scott has served as master of ceremonies for the South Dakota Governor’s Invitational Hunt, is the keynoter at the North American Gamebird Association convention, done seminars at Cabela’s, G.I. Joe’s and other retailers and his “Bird Hunting Boot Camp” seminar has played to standing-room-only crowds everywhere from Pheasant Fest to Filson stores. If you need a keynote speaker, a fundraiser host, seminar presenter or banquet entertainer, Scott Linden can custom-tailor just the right topic and format to jump-start ticket sales or leave your audience better informed and more motivated. Presentations can run from ½ hour to all day. As a bonus, Scott’s appearances can include advance publicity and promotion as well as marketing to his growing “Upland Nation” cult of bird hunters and dog owners. For more information, contact Scott: 541-382-1726. Special rates available for non-profits and conservation groups. Part how-to, part entertainment and all fun, the show highlights the natural beauty and camaraderie of upland hunting. 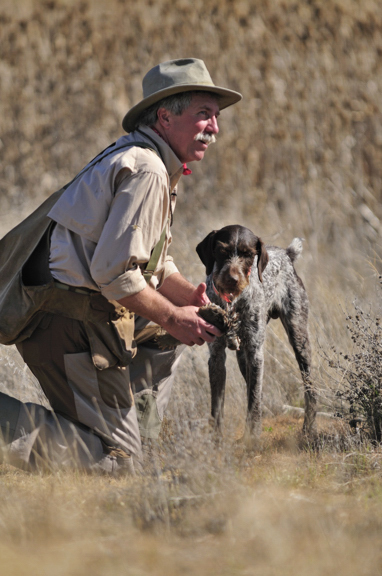 Showcasing what he’s learned following over 150 four-footed hunting companions on TV, Scott’s seminar has something for everyone, novice to seasoned uplander … especially valuable for entry-level and intermediate ability levels. It’s a fun and funny, interactive multimedia presentation that both entertains and educates. He shares insights that aren’t found in the how-to books or videos … often not the traditional way of looking at things! Using his teaching and entertainment background as a jumping-off point, Scott’s presentations are fun-filled learning wrapped in a dry, self-deprecating humor. Topics include: how your dog can make you a better shooter … how “getting high” makes you a better hunter … why a “failure to communicate” may be your fault, not your dog’s … and how simple is often better, for dog names and commands.